and it shall be given him. But let him ask in faith, nothing wavering. For he that wavereth is like a wave of the sea driven with the wind and tossed." The significance of the 2017 mutual theme is multi-faceted, to my way of thinking. It therefore can be credited with the initiation of the restoration of the gospel in these latter days. For it drove the youthful Joseph into a secluded spot in the early Spring of 1820, where his experience opened the heavens and revealed truth hidden from the earth for millennia! But the power of these verses from the New Testament continued to echo through the formative years of the church. Again and again, it's counsel to seek answers via prayer when wisdom was not available regarding key principles, sent the young prophet to his knees, sometimes alone, sometimes with others - and resulted in additional light and truth bursting forth upon the earth. 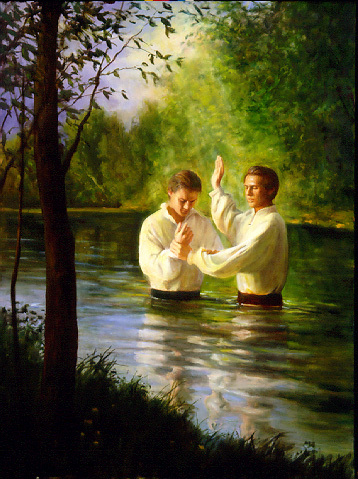 For example, Joseph and Oliver Cowdery prayed for enlightenment regarding baptism - and a heavenly messenger appeared and the Aaronic Priesthood was restored to the earth, and the first authoritative baptisms of this dispensation took place! A good portion of the revelations in the Doctrine and Covenants were answers to prayerful inquiries of those seeking wisdom and direction. We can thank the early saints for their eager seeking for so much of the gospel "fulness" we enjoy today! All because they were willing to ASK. It was like Heavenly Father was just waiting for the question to be posed to Him - He wouldn't pour it out un-requested - but waited patiently till someone thought to ask, and was ready to be answered. While raising my two boys as a single parent, my mother came to live with us after losing her home in a hurricane. Mom was a big help in so many ways. But there was a period when I was really strapped for money - and I began missing payments and being assessed late fees and fines - when I could least afford to pay them. Things were getting quite critical for me financially and I began mentioning my anxiety. My mother could have helped, but didn't offer to do so. I figured if she knew I was hurting and was able to and willing to help, she would simply volunteer. But she didn't. Things got bad enough I finally broke down and . . .
A S K E D! Without skipping a beat, she said, "I have some CD's coming mature, would $5000.00 be enough?" It hit me like a brick on the forehead. Mom was waiting for me to ask her for help. I knew right then that another loving parent similarly waited patiently for me to ask for His help as well. Of course he knows all our needs. He is not blind, deaf or oblivious. But he will not impose His will or wisdom on us. And, I think, it matters to Him that we recognize and acknowledge when he intercedes in our behalf. We all appreciate gratitude expressed, but also, the love we feel when we know someone cares enough to help us is as much the reward as the particular thing offered. Heavenly Father loves us - you and me. He wants us to have the answers we long for, the blessings we crave, and definitely has the power to provide - He also knows our hearts, knows when we are able to bear the truth, able to receive the blessings, and wisely awaits our entreaties for his love and light, when our faith is sufficient to recognize His hand in our lives. I want to acknowledge that my teen conversion bore many similarities to the story of the boy prophet Joseph Smith, Jr. I didn't see it when I was 16 ... I didn't see it for many years. Now it is so obvious to me, I don't know how I missed it back then, but I did. Like Joseph, I lacked wisdom about what church to join. Like Joseph, I was confused by the tumult of opposing doctrine from many churches. And, like Joseph, I finally asked. No pillar of light descended - but my prayers were answered - and the day it happened, sitting across a coffee table from two Mormon missionaries, I knew in my heart that at LAST, I was presented with the thing I had been searching for for many years. 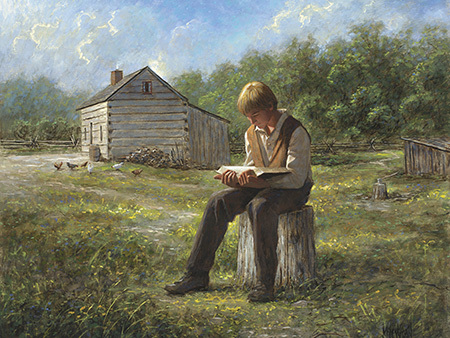 With all the voices filling the air and internet - with all the tugging and pulling from forces in every direction, there has never been a more timely message than this passage of scripture - just as it entered the heart of Joseph Smith, Jr. - it can and should enter our hearts with amazing promise - the promise of wisdom. May we all resolve to "ask in faith" for the answers we seek.